Creamy tomato soup is like the little black dress of soups! It's a comforting lunch or dressed up with simple garnishes, it makes a sophisticated start to a dinner party. 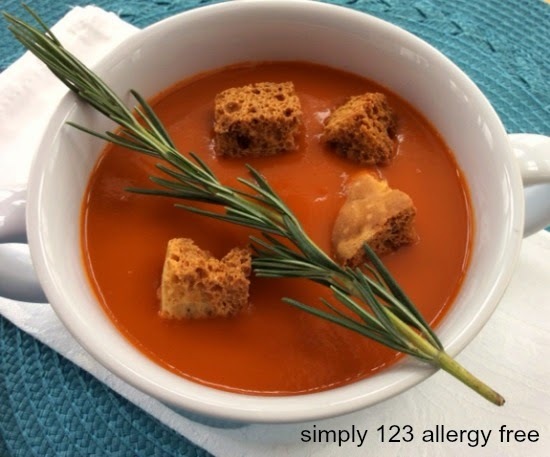 This is a quick and easy recipe for real homemade both gluten and dairy free Tomato Soup like no other you have had before. So warming and delicious! Love this soup! In a large colander placed over a bowl to catch the liquid, drain the tomatoes, pressing on them to extract as much liquid as possible. Add vegetable stock and set aside. In a large soup pot that is already hot, heat the oil over medium heat. Add the onions, and saute until just about translucent, about 4 minutes. Stir in the garlic and saute for 1 minute more. Add 2/3 of the drained tomatoes, the bay leaf, the coconut sugar, and the tomato paste. Cook about 10-15 minutes, until the mixture is very thick and sizzling. Slowly add the remaining diced tomatoes and liquid, stirring constantly while adding. Add the balsamic vinegar, baking soda, and salt and pepper to taste. Simmer the mixture for 5-7 minutes. Discard the bay leaf. Working in batches, or using an immersion blender, puree the soup until smooth. Add back to the pot and stir in the coconut milk. Serve warm and garnish with croutons, if desired. Yummy! I love tomato soup. These looks really good, I am never thought of using coconut milk instead of regular cream. This would be a lot healthier. Thanks for sharing your recipe. Pinning to my soup board! This sounds so tasty and I love that it is gluten free. I always think coconut milk makes soups taste so creamy. Thanks for sharing on Real Food Fridays. Pinned & twitted. Always a favorite, thanks for linking up! Delicious tomato soup, thanks for sharing with Hearth and soul blog hop, pinning.